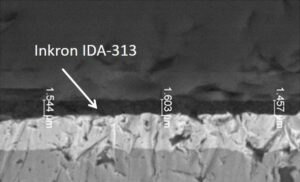 IDA-300 Die attach pastes are designed for applications requiring good thermal conductivity and high optical transparency. IDA-300 series pastes are designed for a range of electronics and semiconductor applications. IDA-300 series products are thermally conductive and optically transparent pastes. These products are solvent- and Pb-free as well as RoHS compliant. Inkron’s technology platforms i.e in-house synthesized siloxane polymers and particle production combined with particle/matrix coupling technology allows us to modify the properties of these products so that the varying customer requirements can be met. Special attention has been given to minimize the contact resistance between the Die Attach and the substrate. 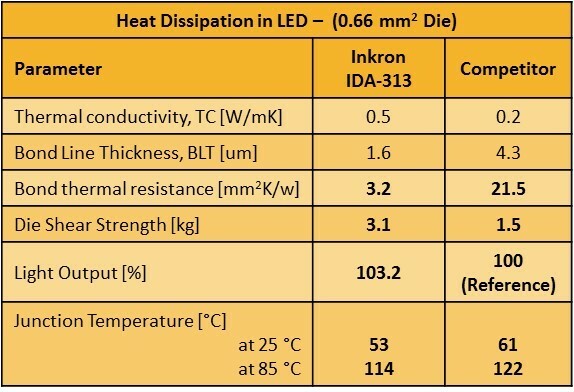 Siloxane based IDA-300 series products have exceptional thermal stability making them the ideal solution for LED and electronics applications. All Inkron’s siloxane based pastes are solvent-free materials resulting into a crack-free, voids-free product with low or no outgassing. 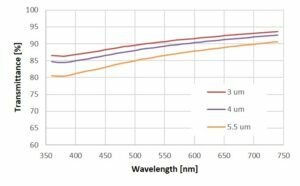 IDA-303 is designed for good thermal conductivity and high optical transparency. Thin Bond Line targets are easily met.